Sinpopo Brand along Joo Chiat Road is one very outstanding retro cafe that we absolutely love visiting for they always have new ideas to surprise us on every visit. Apart from its local-style menu, you will be filled with nostalgia with songs from the 60s and its old-school interior; Sinpopo Brand is truly a local gem that reflects Singapore’s past. Gather some friends and have a lovely time chit-chatting over Sinpopo Brand’s new Weekday (Tue to Fri) Afternoon Tea Set at S$30+ for 2 pax, from 2.30pm to 5.30pm. For our readers, quote “Ladyironchef” along with this post to receive a complimentary bottle of Sugee Biscuits (U.P. S$12+) OR Salted Egg Yolk Cookies (U.P. S$12+). For S$30+, you and your afternoon tea companion get to enjoy a slice of Sugee Loaf Cake, a slice of Durian Pengat or Gula Melaka Cake, 1 Roasted Marshmallow with Salted Kachang & Gula Melaka Ice Cream, a serving of Gula Melaka Jelly, 4 pieces of Sugee Biscuits or Salted Egg Yolk Cookies, and choice of any 2 drinks (any coffee or tea). That’s only S$15+ per person for a whole lot of treats if you think about it! You may know how gula melaka ice cream tastes like, but have you tried Gula Melaka Ice Cream encased in a roasted marshmallow and topped off with salted peanuts? With the sweetness from the fluffy marshmallow and saltiness from the peanuts, it felt like a wild party of flavours in our mouths. This newly curated chilled dessert is definitely one to look out for! If you are a regular reader, you would know that the Durian Pengat at Sinpopo Brand is our weakness (or we have a soft spot for it). Now these guys have come up with a Durian Pengat Cake using that sinful homemade pengat, and it’s just so luscious. When we dug into its rich creamy pengat and pandan cake layers, we fell in love all over again. Usually only available online, you can now try it with the limited tea set promotion! Do not despair if durian is not your calling because you can choose to have Sinpopo’s signature Gula Melaka Cake instead! You can see the distinct layers of gula melaka fudge in between thick slices of moist cake topped off with gula melaka glaze. Sinfully rich, this is one for the sweet tooth. Reintroduced in a loaf cake version this Chinese New Year, the delightfully light, moist and fragrant Sugee Loaf Cake, made of Sugee, almond and browned butter, is best eaten with the generous portion of vanilla bean cream. Just when we thought that the Gula Melaka Jelly might be overshadowed by everything else, it was surprisingly light and refreshing addition to the tea set. We liked having the jelly in between bites to alternate with the strong flavours. 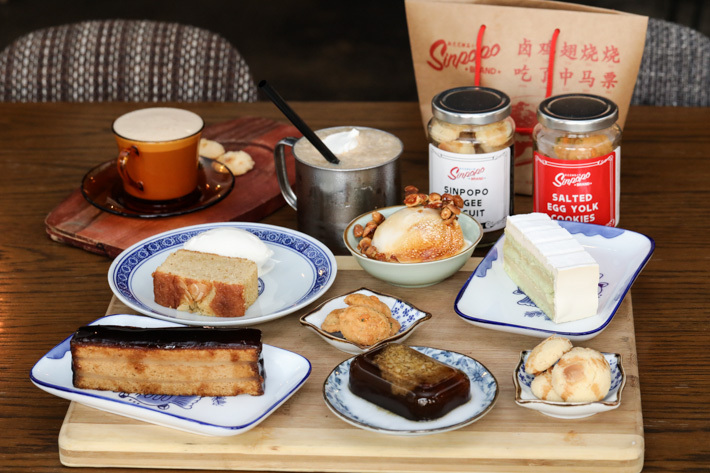 Choose any coffee or tea from Sinpopo Brand’s menu with every order of the weekday Afternoon Tea Set. Of course, we would pick the signature Sinpopo Teh Tarik Special and Kopi Peng because not only are these perennial favourites on the drinks menu, they are ever comforting. Nothing beats a good cup of Singapore-style teh and kopi, yes? Other coffee selections on their drinks menu are Kopi Macchiato, Cappucino, Long Black and Flat White; while tea choices include Earl Grey, Turkish Apple, Roman Chamomile and so on. Cookies at Sinpopo Brand are not to be overlooked. Trust us on this; we’ve had several bottles ourselves. These amazing bite-sized crumbly cookies are so addictive! The Sugee biscuits bring along such a nostalgic taste with strong buttery notes, while the salted egg yolk cookies with curry leaves are a heavier option bearing the distinct saltiness that all of us love. Do come down to enjoy Sinpopo Brand’s new Weekday (Tue to Fri) Afternoon Tea Set at S$30+ for 2 pax (U.P. S$46.50+) from 17 Jan 2017 to 28 Feb 2017, 2.30pm to 5.30pm, and remember to quote’ ladyironchef’ along with this post to receive a complimentary bottle of Sugee Biscuits (U.P. S$12+) or Salted Egg Yolk Cookies (U.P. S$12+). This post is brought to you by Sinpopo Brand.